I am always interested and excited to see performances (dance, theatre, music) that are setting-specific, designed for the performance space. There is something special and unique that happens when a show is cultivated with and using its setting. There is so much strength, and significance, that can be derived from setting. The Talking Treaties Spectacle is an extraordinary example of setting-specific theatre. 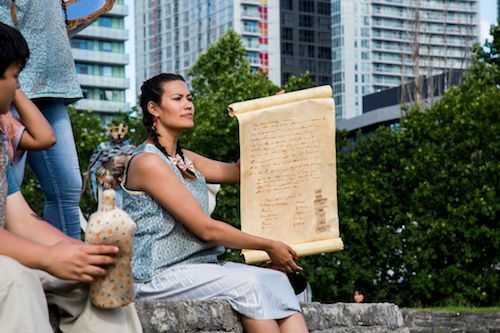 The show, according to the program, is “an outdoor pageant exploring the treaty history of the Toronto area through words, song, movement, puppetry, and spectacle”. The show is absolutely a spectacle, in all the wonderful depictions of the word, as well as being educational and enlightening. Talking Treaties explores the rather muddy history surrounding the treaties of the Toronto purchase, i.e. how the British and existing Native communities came to an “agreement” for the natives to give/sell their land to them. The show features a lot of quotation marks around works like “agreement”, “legal”, “sale”, et cetera. While delving into the history of the treaty discussions, we can really see how many agreements were unclear, and Talking Treaties shows concrete examples of the native communities being taken advantage of. The show is an ongoing project with goals of spreading knowledge and understanding to a wide audience about the fogginess of the history in this area. There was a highly enjoyable educational aside in this performance, where the audience was shown just how many people had contributed to the project. Historians, elders, archivists, community groups, and artists of many scopes were all engaged, to name a few. Learning about one’s own history is always exciting, and Talking Treaties shows how that excitement can be coloured when the real facts come to light. The setting was especially spectacular, as we walked around different locations at historical Fort York, musing about early warfare, the beaver trade, and the long-lasting stamp of colonialists. The spectacle was wonderful, including as stated, many types of engaging art forms. The puppetry was a favourite of mine, and the children in the audience as well I think. Puppetry onstage can be hit-or-miss, but I found the construction of the props in this show was wonderful (community-sourced as well! ), and helped to emphasize themes with skill. Important themes or objects were blown out of proportion in terms of size of the puppets, and brought a little whimsy to a show with quite serious subject matter. In fact, all of the creations that were made, a quilt, map of the region with braided rivers, and props, were all well done and added to the show. It was also especially interesting to see a show that was completely accessible and open to all types of actors and viewers. I found the acting to be a little on the weak side in terms of some of the actors’ comfort level with the material, or perhaps the unusual demands of an outdoor setting, but Talking Treaties is a type of workshop-stage show. The show will continue to develop through more workshops and presentations into next year, partnering with Black Creek Pioneer Village. Overall, I absolutely enjoyed myself at this performance. The subject matter was enlightening, and I appreciated the sneak peek into how it was all created. While the pacing was a little off at times, rushing through different settings so the audience was nearly constantly walking, I think the setting at Fort York contributed greatly to the effect of the show. I would recommend Talking Treaties Spectacle to any person living in the Toronto area. Knowing one’s history is so special, and such an important part of moving forward in our lives. Thank you to the vast group of people who have worked on this show for bringing and sharing their knowledge. Grey’s Anatomy “Map of You"